Momofuko Daisho: What Next With Fusion Cuisine? My first encounter with fusion cuisine was many years ago at Susur in Toronto. The tasting menu was a quintessential blend of western and eastern ingredients and culinary skills. I was happy and proud that finally, someone from my home city of Hong Kong had made it to the world stage of cooking. After all, Susur Lee began his cooking career in none other than the prestigious Peninsula Hotel, where he apprenticed with the best chefs in town. When fusion cuisine was introduced as a dining concept a while ago, nobody could predict that it was here to last. In fact, thanks to global travelling and customers in big cities becoming more adventurous and open-minded in their taste, fusion cuisine has evolved from a fine dining experience to a regular affair and has become mainstream. When Chef David Chang made his name with ramen in New York, and popularized his Momofuku logo with his restaurants and recipe books, he re-ignited the interest in fusion cuisine, his fusion cuisine. I began to wonder whether something new was happening with fusion dining. He opened his three Momofuku restaurants—The Noodle Bar, Daisho and Shoto— and Nikai, the Bar, to raving publicity and excitement within the gourmet circle in Toronto last Fall and I decided to explore what the magic was all about. I spoke to my daughter about my intention and I got a “wow” reaction from her. Yes, from what I have read, Momofuku is popular among the younger working generation. So I picked Daisho, and I brought my family along. 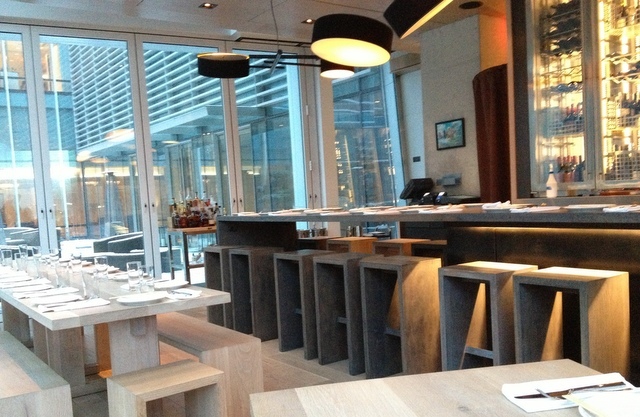 Daisho was located on the third floor of the Momofuku complex adjacent to the Shangri-La Hotel on University Avenue. On entering, I noticed the floor to ceiling glass windows with an unobstructed view of University Avenue stretching from south to north. There was hardly any décor and the place struck me as austere, even stark but for the warm lighting. We were seated on plain wooden benches, although there were chairs for the tables near the windows. I felt deprived, not only because there was no padding on the benches, but every time my husband wanted to adjust his seat, I had to shift as well. The menu listed dishes described in English and grouped under headings with Japanese kanji. With our knowledge of Chinese characters, we could figure out part of the reasoning behind the categories. For our family of five, we had pre-ordered the porchetta, which was a kung-fu dish, translated literally from the menu. This category should mean the house specialties. We also selected one dish from the sections interestingly termed Carbohydrates, Winter (seasonal greens, I guess), and Lettuce Wraps. The sweet white buns, the wasabi sauce and kimchi mustard that were served as side dishes breathed their Chinese, Japanese or Korean connections. There was a touch of fusion with the lettuce wrap which came with hanger beef, or the black rice congee with bone marrow. The only novelty for me was the salsify with steelhead roe. The food was good to very good, depending on what we ordered. Still, as I was biting into the brined pork of the ham-like porchetta, I wondered if the brining was just a short-cut to the traditional slow roasting. I also realized that I was looking for the wrong experience all together. Momofuku is a marketing gimmick, with questionable success, which attempts to fuse cultures, not food. It makes you sit on hard benches that I doubt would motivate you to spend more time practicing how to sit on a tatami to build the endurance of your gluteal muscles. It gives you a menu part of which you cannot read so that you would ask, and will learn that the character means “origin” and this is your hors d’oeuvre. But how will it help with your non-existent Chinese or Japanese vocabulary? You are offered a large format dish—the kung-fu dish–so that you can tear the meat off the chicken family-style like the Chinese and the Koreans. Yet the Italians and the Greeks do that too. The caveat: you are paying a lot for the food to expand your cultural horizon with Momofuku. Besides, what you get from the food hardly qualifies to be called fine dining. It’s the same now familiar fusion cuisine we have known. The location is expensive, but Momofuku Daisho has saved on the décor. I still miss Susur, the restaurant from which Chef Susur Lee launched his international career and attained global fame. I like the white table-cloth, the expensive cutlery and the different wines that paired with the small plate food which woke up my taste buds. Fusion or not, it was fine dining, par excellence. I want a memorable gastronomic journey, not cultural enlightenment.